If there is one thing I cannot under any circumstances run out of in our home it is Reese Spreads. My family is obsessed with delicious chocolate peanut butter spread! I will often find Steve standing in the kitchen spooning it onto just about anything. Let’s just say that I may have a small stockpile in my cupboard, never allowing the number of jars to dip below 4. 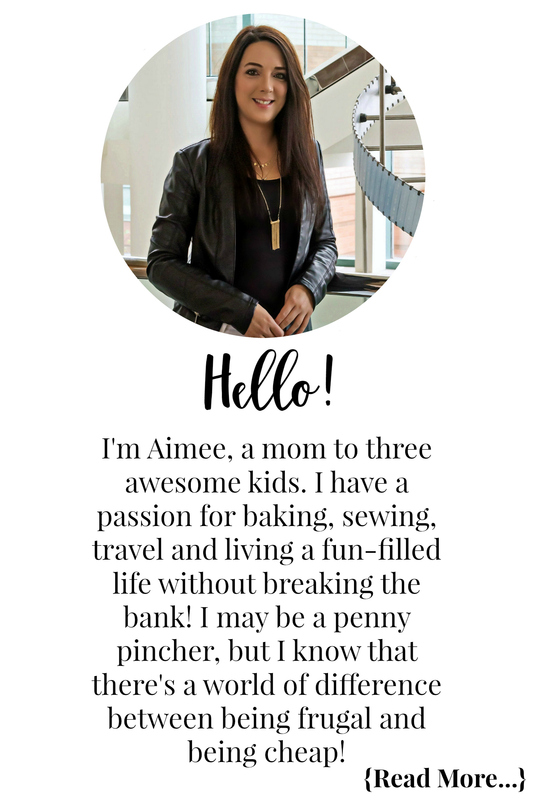 While my family may be spreading Reese Spreads on cookies, english muffins, ice cream, and more, I love the versatility of the product as an ingredient in the delicious recipes I make. I probably bake at least once per week and at least 2-3 of those times I am using Reese Spreads in the recipe! Summer is still in full swing and today I wanted to share with you one of my families absolute favourite Popsicle recipes. These bad boys never last long in my freezer and whenever we have guests over I can always catch them checking to see if I have any in there – I always do! It’s a sweet, creamy, decadent summer treat that is sure to not only refresh you but have your taste buds begging for more. This recipe is so easy to whip up and only requires a handful of ingredients! 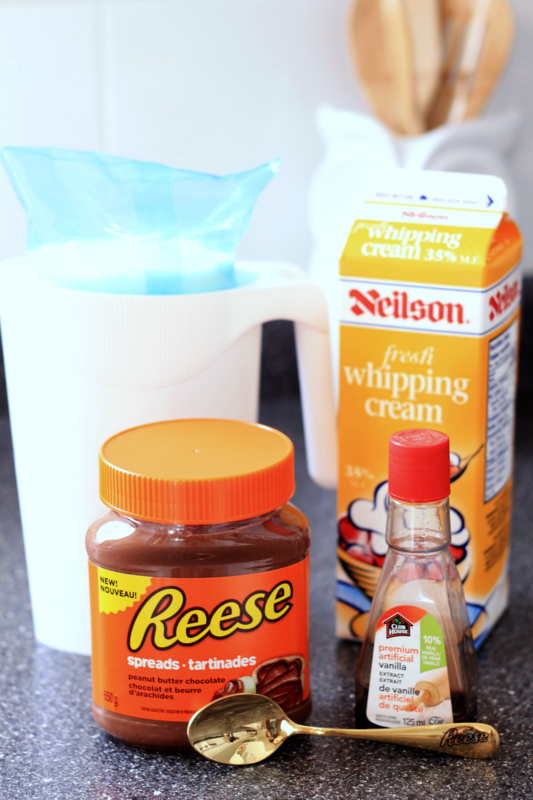 Get all your ingredients together for the popsicles; milk, heavy whipping cream, vanilla, and Reese Spreads! Add all of your ingredients into a blender. 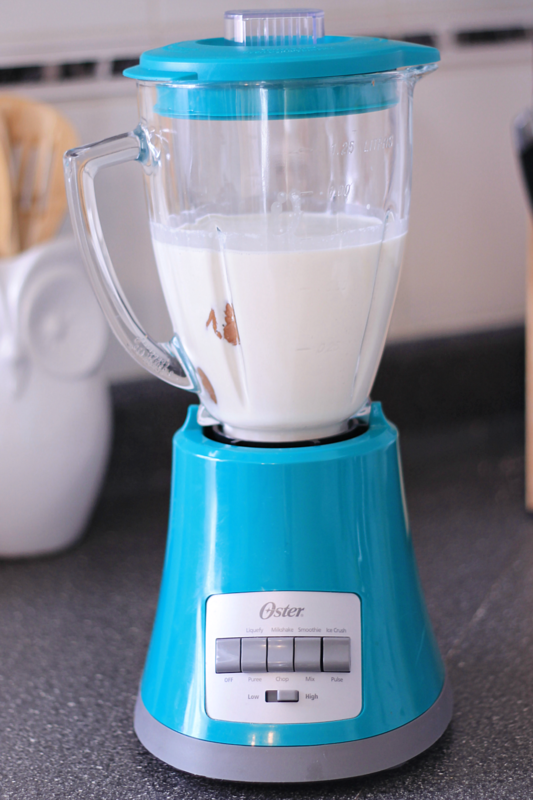 I use my inexpensive Oster 8-speed blender which works great! Blend those ingredients together until fully incorporated and smooth. Next you want to carefully pour your mixture into a popsicle mold. I love my Norpro Frozen Ice-Pop Maker I bought on Amazon. It makes those old-fashion looking popsicles. It was a great investment as we were always losing the sticks to the cheaper type of ice-pop molds we had. Pop your lid on, sticks in and place it in the freezer for 4-6 hours. This is another thing I love about this popsicle mold, it uses real popsicles sticks that can be recycled afterwards — no more losing those plastic popsicle handles! Last step if you want the crunch factor is to dip your popsicles in a chocolate coating and sprinkle with crushed nuts. See below for full recipe! 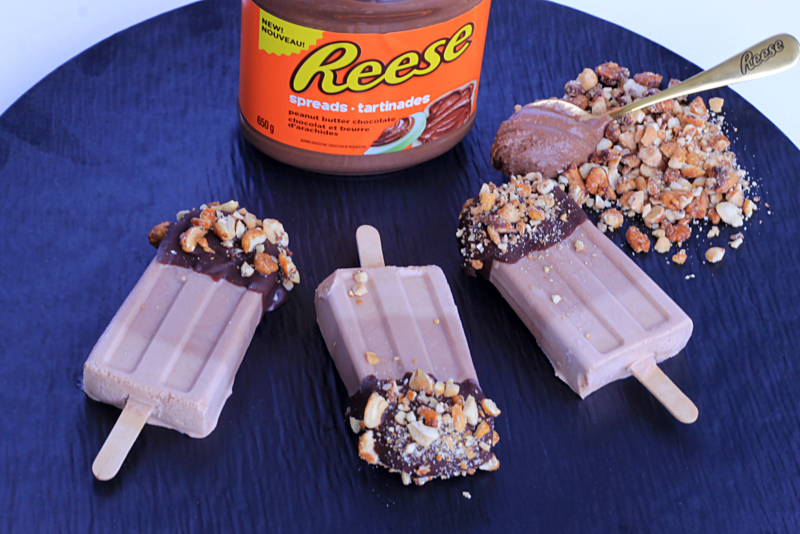 Place your Reese Spreads, milk, heavy whipping cream and vanilla extract for your popsicle mixture into your blender. 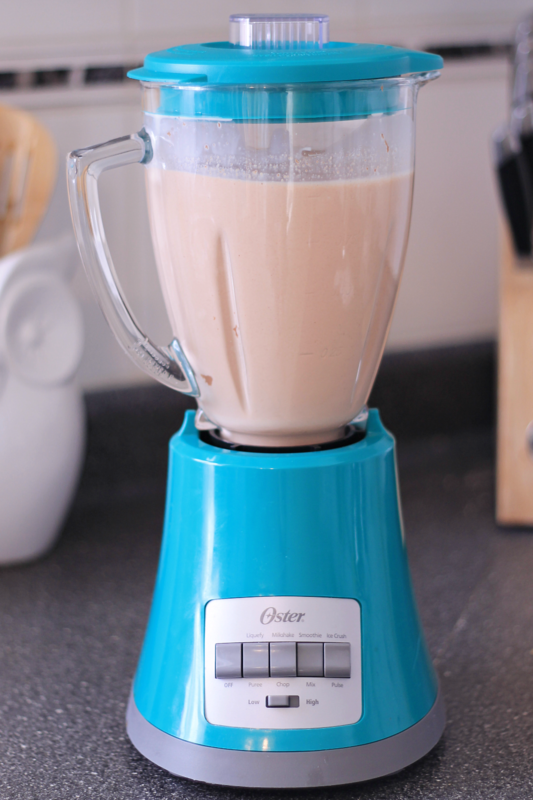 Blend on high using either your liquefy or smoothie option until fully mixed and smooth. 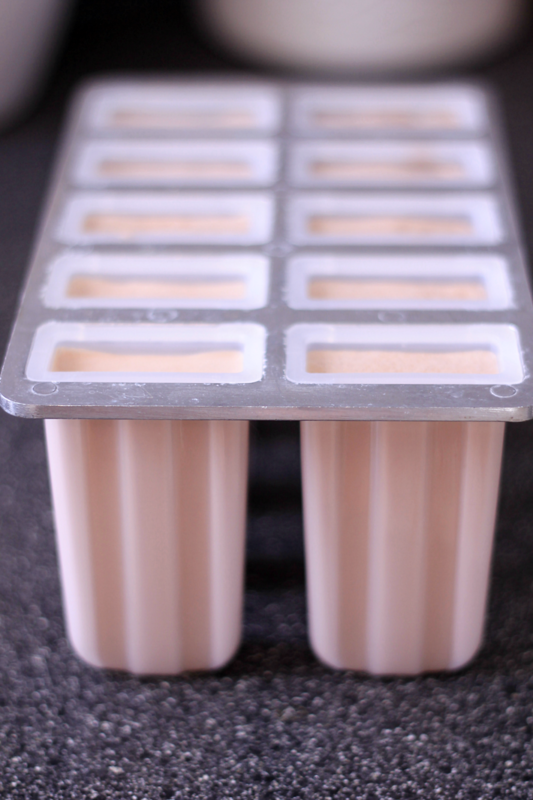 Pour your mixture into your popsicle molds and insert the sticks. Freeze for at least 4-6 hours. Once your popsicles are fully frozen run the mold under warm water to release popsicles and place them on a waxed lined cookie sheet back in the freezer. While your popsicles are freezing take your nuts and crush them. Set aside in a dish for later. In a microwave safe bowl melt your chocolate chips in 15 second intervals until fully melted. Add in your Reese Spreads and combine. Then slowly add in a little bit of butter at a time until you have a smooth chocolate mixture – not too thick, not too runny. Place mixture in a narrow container for easy dipping. Dipping the popsicles is probably the trickiest part. 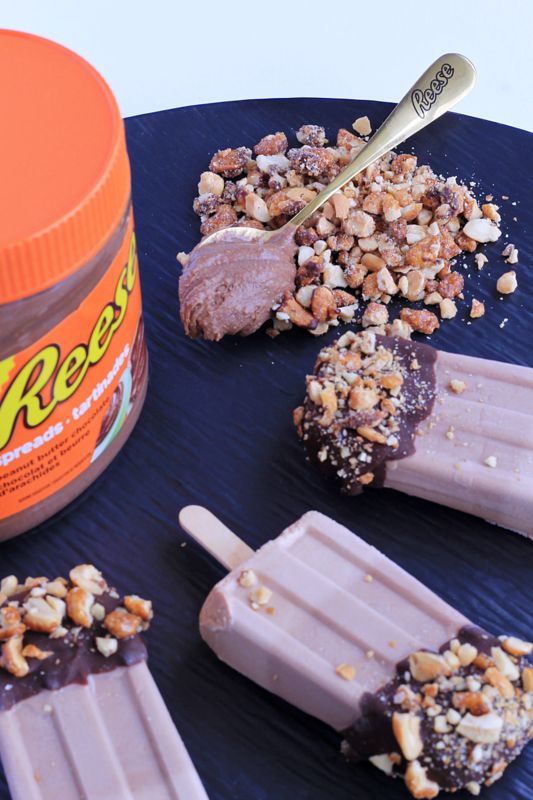 You want to only bring out 2-3 popsicles at a time or the others will start to melt and the chocolate coating won’t adhere to them. I like to do this on my kitchen table right next to my freezer to quickly get them out and back in. Dip popsicles 1/2 way in melted coating mixture and then immediately sprinkle with chopped nuts. Return popsicles to the freezer to set the chocolate, about 5 minutes. 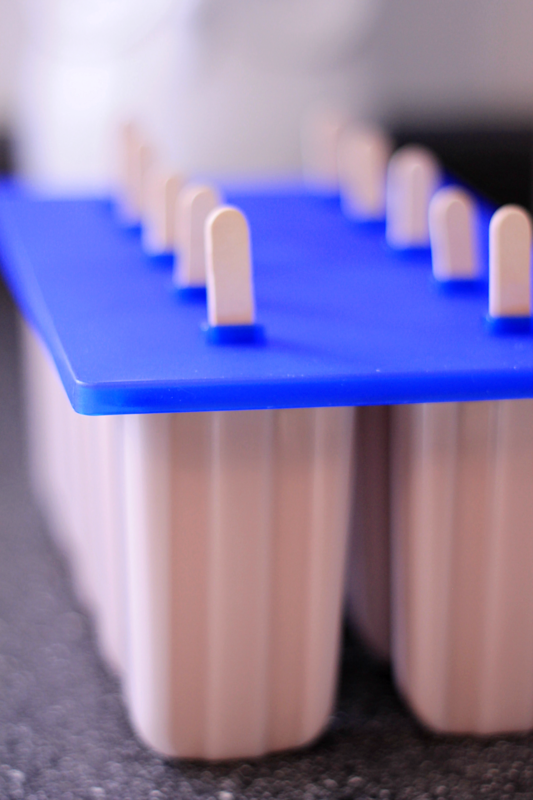 To store your popsicles you can place them in an airtight freezer container or freezer bag. 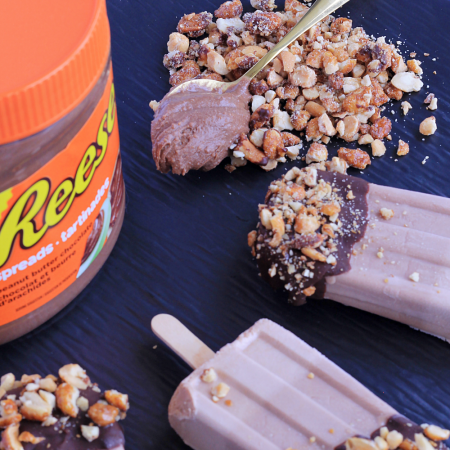 I hope these delicious Peanut Butter Chocolate Crunch Popsicles become your family’s favourite summer treat. What has been the highlight of your summer? Let me know in the comment section below! Disclosure: Although this post has been sponsored by Hershey Canada as part of the Golden Spoon Recipe Series, the opinions and language are all my own, and in no way do they reflect Hershey Canada. Any product claim, statistic, quote or other representation about a product or service should be verified with the manufacturer, company, provider or party in question.